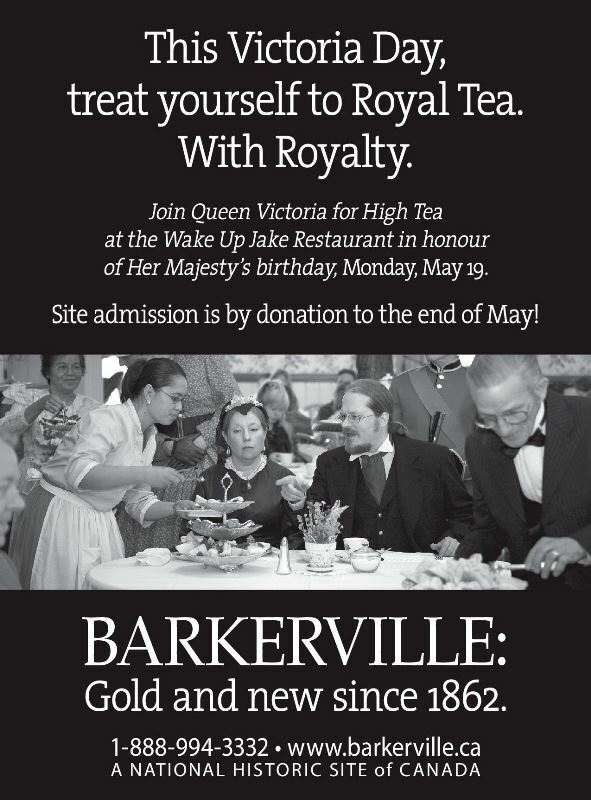 On Monday May 19th – Victoria Day – visitors to Barkerville Historic Town are invited to enjoy Royal Tea with Royalty, as ‘Queen Victoria’ visits Barkerville’s world-famous Wake Up Jake Restaurant for two sittings of afternoon High Tea – at 1:00 PM and 3:00 PM. Patrons will have the opportunity to enjoy one-on-one audiences with Queen Victoria and her Scottish consort ‘Mr. Brown’ as well as British Columbia’s original Chief Justice, Matthew Baillie Begbie. Red Serge-clad members of the local Constabulary are expected to be in attendance to keep the peace and ensure the safety of the Monarch of Great Britain and Ireland, also known as the Empress of India. The Queen, who celebrates Her birthday every third week in May, is reported to be in a remarkable state of fitness and vigour, especially considering Her advanced age of 195 (in 2014). There are two official sittings at the Wake Up Jake Restaurant for the Royal Tea, at 1:00 PM and 3:00 PM. Tickets for the event can be purchased at the Visitor’s Reception Centre upon entry into Barkerville Historic Town, for $16.95 per person. Barkerville opens for the new season May 15th with an all-new street interpretation program, along with expanded mining discourses that describe the workings involved with hydraulic mining on Williams Creek. Visitors to Barkerville in 2014 will also, for the first time since 1864, have the opportunity to meet ‘Billy Barker’ himself. Best of all – for the month of May admission to the National Historic Site is by donation. For more information about Barkerville’s annual Victoria Day Royal Tea, or any of Barkerville’s 2014 seasonal special events, please visit www.barkerville.ca.